A fine-looking garden is a delight, but your charming garden can quickly become a source of unwelcome rubbish in the form of twigs, foliage, and lawn trimmings as well as cast-off implements, tools, and other garden paraphernalia . Whether your garden is nestled in a cosy corner lot or spans several acres, our qualified teams can manage the task for you. 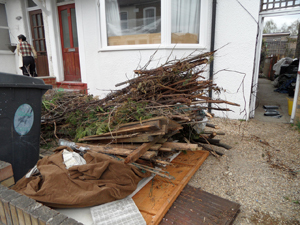 We will purge your garden of everything from old flower containers to timeworn fence panels and anything in between. We can remove sheds or simply clear the contents to make room for new garden tools . Give our team your garden clearance to-do list and they will get it done! As soon as the junk has been collected and removed, we will sweep the area clean. Maintaining a picturesque garden demands consistent removal of discarded and unused items, but this can be an ongoing and time-consuming occupation. If you’ve got more pressing things to do, then give Junk Collection a call. Our well-organised and capable teams will have all of the unsightly debris cleared in no time at all, leaving a clean “canvas” ready for your special touch. Contact Junk Collection for a free quote, and give your garden the transformation it deserves .